Capital One InvestingSM Mobile gives you straightforward tools and features to help you make informed investment decisions and take control of your financial future. With easy-to-use research tools, this app lets you call the shots whenever and wherever you choose. It’s transparency and flexibility right at your fingertips. TRADE Buy and sell stocks and exchange-traded funds (ETFs). UP-TO-THE-MINUTE INFO Get detailed stock quotes. 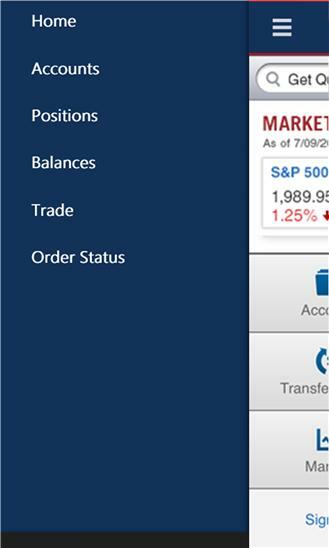 MANAGE YOUR PORTFOLIO View positions and trade status, track gains and losses, and check balances. SAFE AND SECURE Your personal information is fully protected and securely stored. DON’T HAVE A CAPITAL ONE INVESTING ACCOUNT? No problem. You can still get instant quotes, consult charts and more. Want to trade, too? Go to CapitalOneInvesting.com to open an account. There’s no minimum and it takes just minutes. ********************************************************************************************* Images are for illustrative purposes only. Any displayed symbols, quotes or charts are not recommendations or advice. Banking services are provided by Capital One 360®, a division of Capital One, N.A., Member FDIC. Securities are offered by Capital One Investing, LLC, a registered broker-dealer and Member FINRA/SIPC. 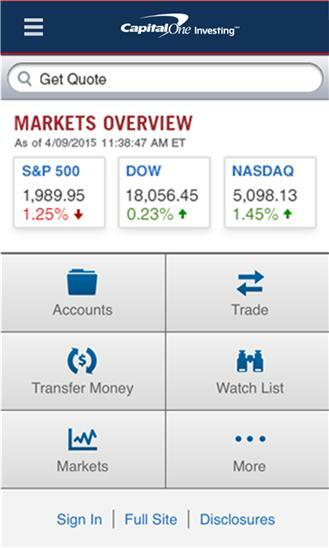 Advisory services are provided by Capital One Advisors, LLC, an SEC-registered investment advisor. Insurance products are offered through Capital One Agency LLC. All are subsidiaries of Capital One Financial Corporation. ********************************************************************************************* Securities and services are: Not FDIC insured • Not bank guaranteed • May lose value • Not a deposit • Not insured by any federal government agency ********************************************************************************************* © 2015 Capital One. Capital One and ShareBuilder are federally registered service marks. All third-party trademarks are the property of their respective owners.